Lennard’s Aaron Jenson, #14, drives for breakaway layup in the hard-fought Durant victory last week. The Longhorns #15 Jayden Lacey and #13 Casey Johnson trail the action. Coach Zerko Stojavonich’s Lennard Longhorns exhibited resiliency and tenacity, as they have all season, by bouncing back from two disappointing losses in mid-January with a pair of nail-biting, big wins within the friendly confines of their home corral. Trying not to get ahead of themselves, the Longhorns head down the stretch of a very successful regular season before opening play later in February with an unknown opponent at an unknown site in the first round of the district playoffs. As of press time earlier this week, the Lennard Longhorns’ mark is an overachieving 14-8 overall and 7-5 in district. The Horns complete the regular schedule the last week in January and first week in February with games with winless Leto on Jan. 29 at Tampa, and with 18-2 Freedom at Tampa on Feb. 5. Blake, 14-13, comes to Ruskin Feb. 8. 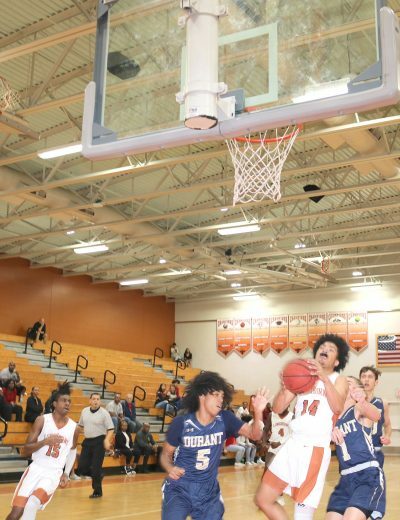 At home last week where the Longhorns are 5-3, Lennard posted victories over Bloomingdale on Jan. 25 by a razor-thin 42-41 score and over Durant 60-56 in another thriller on Jan. 24. The Bloomingdale Bulls basketball team, unlike the Bulls’ powerhouse football squad, is finding wins hard to come by in basketball. The guys from Valrico are well coached and their record does not indicate how good they are. But the fact is, the Bulls are cellar dwellers in the district with the Longhorns who squeaked out a victory over the 1-16 visitors for the second time this season. The low-scoring game was a roller coaster. Bloomingdale would make a run to take the lead. Then Lennard would regain the lead. Making it even more difficult for Lennard and Stojavonich was the fact that Longhorns’ top scorers were in constant foul trouble and Stojavonich had to sit them down for long spells, but the bench came through. No one can argue with Stojavonich for that statement about Lennard at home, as the Longhorns sweated out another gut-wrencher over Durant the night before. The Cougars are a much better team than Bloomingdale as Durant sports a 5-11 mark overall and 4-8 in district. Also, although the game went down as a forfeit victory for Lennard at the first of the season, Durant beat Lennard on the scoreboard 69-62 prior to the revelation that the Cougars had used an inelegible player. The visitors from rural Durant were looking to gain ground on Lennard in the district standings. But Lennard holds a frim grip on fourth place behind Tampa Bay Tech, Plant City and Strawberry Crest. The Lennard win over Durant was sparked by the balanced scoring spree of Rae’Shaun Wilson with 18 points and C.J. Peterson 14, Jayden Lacey 9, Aaron Jensen 9, Casey Johnson 6, David Flannery 2 and Maurice Pickett 2. After a thumping at home from Tampa Bay Tech and a 52-46 loss at Crystal River on Jan. 21, Lennard embarked on its current three-game winning skein by beating East Bay 82-72 in overtime at the Indians place.